Registered medical clinic offering the best of laser treatments, anti-ageing rejuvenation and skin surgery in the heart of Harrogate. Recent years have seen treatments such as Laser Hair Removal and Lip Fillers become some of the hottest skin trends. When carried out in the right way, people can be amazed at the results they get from aesthetic treatments and laser procedures. But how can people confidently choose a place to get treated when the industry is still largely unregulated? For nearly a decade, Good Skin Days has built a reputation for safe, medical clinics in which skin treatments are carried out by staff who are trained and equipped to a standard more akin to a private hospital. 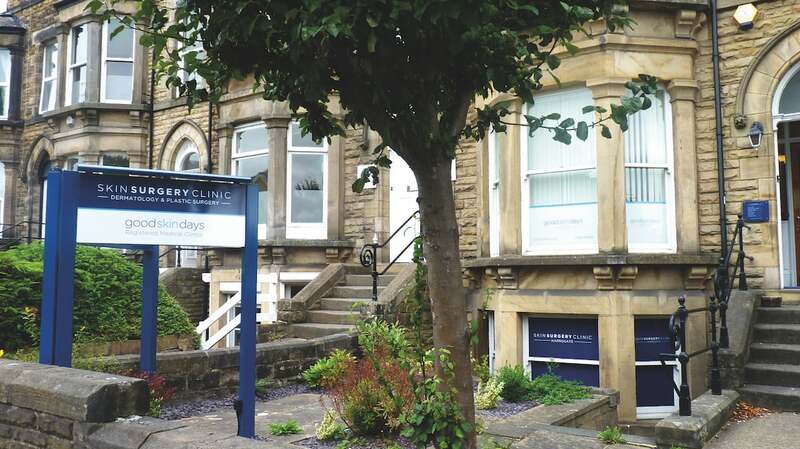 Our Leeds-Bradford clinic has grown to become Yorkshire’s largest skin clinic. We’re excited to now also be in Harrogate! Our clinic at 39 East Parade was completely refurbished and equipped to our specifications in 2016. It has a fully equipped Minor Ops Suite used by our specialist GPs and Consultant Plastic Surgeons. Upstairs, our treatment rooms have the very latest in advanced medical laser equipment. We’re also the UK Training Academy for laser manufacturer Asclepion, offering expert training to practitioners and clinics nationwide. Our Medical Team in Harrogate includes Consultant Plastic Surgeon Mr David Mather, specialist surgical GP Dr Andrew Smith, Advanced Nurse Prescriber Petra Kitching and Laser Practitioner Georgina Leach. All are overseen by our Medical Director Mr David Watt, who leads our team across both Harrogate and Leeds. Our injectable treatments use only genuine products like Juvederm and Botox, sourced directly from the manufacturer, Allergan, and are administered only by specialist Doctors and Nurse Prescribers. Our clinic is registered and inspected by the Care Quality Commission. We are also four-time award winners of prestigious industry awards for the Best Skin Clinic in the North. Treatment starts with a totally FREE skin consultation, where we discuss your goals and treatment options, and answer all of your questions. If you’re interested in Laser Hair Removal, we also offer a free Test Patch. Alongside our ever-popular Laser Hair Removal courses we also offer some of the most popular treatments from our award-winning Leeds clinic: from the subtle anti-ageing effects of Dermal Fillers, to the most effective Hollywood-grade Fire & Ice Facials, and a range of specialist options to improve skin condition and hold back the hands of time, whatever your age. Our Laser Hair Removal service is offered completely Pay-As-You-Go – no contracts, and no paying up front for a course. For a limited time we are offering a free first treatment worth £49 on some of our most popular Laser Hair Removal areas including underarms and bikini line. Just mention Mumbler when you call us. Check the full list of £49 areas you can choose from on our price list here. Good Skin Days Harrogate is at 39 East Parade, HG1 5LQ. We run clinics over Monday to Saturday each week. Call us to book a free consultation on 01423 549193.